Note: this post was adapted from my first Tinyletter email. If you want to get emails from me about whatever I feel like, you can sign up there. You are probably familiar, as someone reading this English-langauge text, with the Latin alphabet. But perhaps you are less familiar with all the letters that aren't in the Latin alphabet, but could be. As a rule, I think, the amount of plausible nonsense tends to exceed the amount of sense. This is one of the (many) things I like about nonsense. There are, for example, more words that could plausibly be part of the english language from a phonological perspective than there are "real" words in use. And, I posit, more letters that fit the aesthetic rules of the Latin alphabet than actual letters in the Latin alphabet. Of course, this is contingent on how you define those aesthetic or phonological rules. I'm already seeing possible letters I missed, but I don't want to take another photograph of that notebook page. At any rate, someone could probably throw a machine learning algorithm at this and get more interesting results that way. As to the relationship between the shapes of letters in their lower and uppercases, I'll leave that as an exercise for the reader. Extra credit: cursive. I don't expect the Latin alphabet-using world to come to a consensus about which nonletters are valid, but I am willing to state, without getting more particular, that there does exist a set of valid nonletters. Perhaps they exist probabilistically, based on their plausibility. But let us take for granted a certain set of additional letters: now, where do the fall within the order of existing letters? It would help, in answering that question, to know why the letters are ordered the way they are, but that seems to be a mystery. But it doesn't seem likely to me that all these nonletters would all just so happen to belong after Z. Rather, they would be interspersed within the standard alphabet. If the alphabet partially consists of these unacknowledged symbols, the implications are immense for what else must also be missing. If there is a letter between, say, C and D, then surely there must also be a musical note between those two tones. If there an iterator variable between i and j, then we must reconsider our code (not to mention our O(n) calculations). 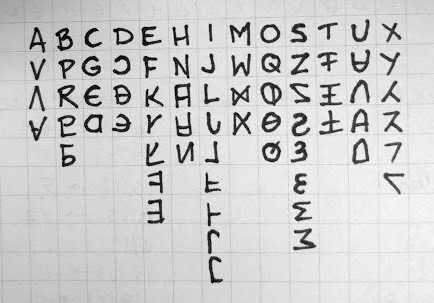 And if these letters are there but unknown, that may imply that these letters are in our words as a sort of Fnord: present, impactful, but unseen. Not only does it seem inevitable that the words we already know contain symbols of which we were not aware, it must also be that there are whole words completely nonpresent in our language. Do they exist implicitly in our sentences? Perhaps one day an optical or literary device will be invented that reveals the hidden letters in our text, and finally shows us the complete versions of our works. For now, we will have to make do with wild speculation.